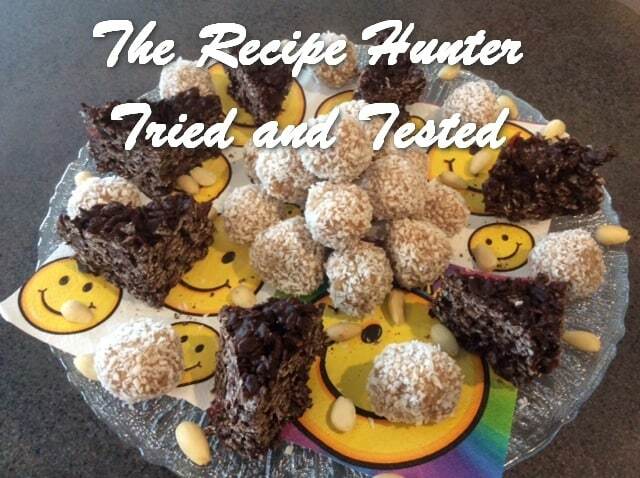 Raw vegan Raffaello balls, rolled in coconut with an almond hidden inside. Delicious is an understatement, albeit my humble opinion. Recipe credit: Myhealthydessert for Delicious Homemade Vegan Raffaellos and this is how I made mine. I doubled the original recipe and made 24 balls, and I am very happy that I made a double batch – WOW, this is so so delicious and yummy – a definite keeper in my books for a treat for my vegan family members. As per the original recipe (see link above), if you prefer to use raw fresh almonds, you will have to grind them to almond meal. I just bought a packet of ground almonds, way easier and quicker. I nuked the coconut oil and coconut cream for 15-20 seconds in the microwave, then whisked it till well combined. Add the nut butter, vanilla and maple syrup. Use a small hand whisk and mix everything together. Add almond meal and 2 cups coconut. Mix well with a wooden spoon, till you have a nice even consistency. It will be sticky and should be thick-ish. I had no need to add extra coconut, but if you think it’s not thick enough, feel free to add extra coconut to thicken it up. Place the mixture in the fridge for an hour or more to set (I left mine for approximately 2½ hours as I had to go out and run some errands) and its solid enough to work with it. 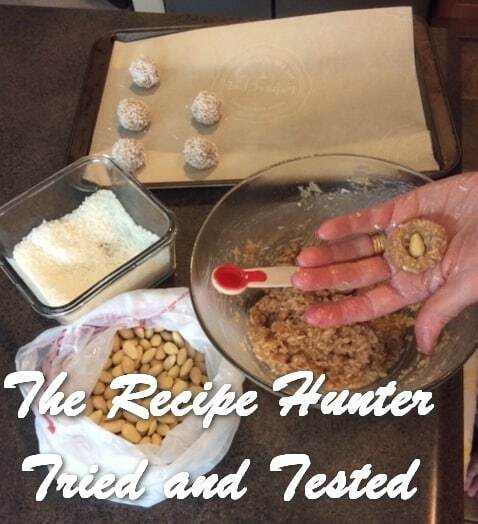 Use a 1 tbsp measuring scoop and make a ball with the dough in the palm of your hand. Make a hollow with your finger in the middle of the ball, place an almond inside and roll back into a ball. In a separate container, with the extra cup of coconut, roll the balls one at a time in the coconut, till well covered. Place on a tray, covered with parchment paper, and keep the balls in the fridge overnight before serving, that is if you have the willpower to wait that long. Cut in 3 x 3 in blocks and then into triangles.